Fall fashion runways showed off a lot more than the latest clothes and shoes. They also brought us the latest trends in hair colors and styles for the cool months ahead. With both color and style, there were some traditional looks, as well as some that were taken up a notch or two. First off, color. Color trends this season range all across the board from the classic Swedish blonde to the bright orange-red seen in shows like Tadashi Shoji. In between the two extremes is strawberry blonde, a popular hue on the runways, while the warm copper shade shown off on the Tommy Hilfiger runway provides a warmer tone. For brunettes, tones of deep chocolate and truffle brown are popular, as well as an ashy black hue that showed up on the Tony Burch runway and looks particularly good on wavy, tousled hair. For those who are more feeling a little more daring, try hot pink and platinum streaks as seen on the Gucci catwalk, or a silvery white tone for sophisticated elegance. 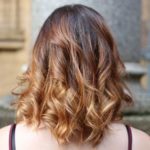 You might think the days of wavy, Bohemian hair left along with the warmer temperatures, but that’s not the case. Bohemian waves are actually a popular trend in hair for fall and winter too, and there’s not much to it. They can be achieved by letting the hair dry naturally for softer, looser curls or by braiding the hair while wet and then letting it dry, which will give you more of a defined wave. The look can be changed up by parting it in different places – try a side part for a more casual look or a sleek center part for a bit more sophisticated look. You can also dress up the waves with dramatic make-up like a smoky eye or dark lipstick. On the opposite end of the spectrum, is the stick-straight looks seen on the runways of Dior, Nicole Miller and Carolina Herrera. Whether it is left hanging loose or slicked back, parted deeply on the side, or pulled back in a ponytail, perfectly straight hair is a look you can’t go wrong with. The French twist has been around for years, but this year’s trend changes up the look just a bit by leaving it slightly looser. The younger, “hipper” look is more casual, appearing that it was just twisted up on the go, yet looking stylish at the same time. The twist can be secured with a statement piece like a thick ribbon or a jeweled pin, or simply held in place with bobby pins. Leave the ends hanging loose toward the side of the head for a more unkempt look, or pull it all back sleek for a more sophisticated style. One of the biggest hair style trends for fall 2015 is the low ponytail, at the nape of the neck. The look works with both messy and sleek hair, and offers an air of effortless beauty that is both simple and feminine. The look can also be dressed up by binding the hair with a leather ponytail holder or metallic jewelry. They can be at the nape of the neck, the back of the head or anywhere in between, but the new “bun” is looser, more casual, yet still stylish and chic. Whether adorned with jeweled pins or left plain, the feminine look was seen all across the runways. Another popular touch was leaving some strands of hair hanging loose, as to gently frame the face. Why decide between pulling the hair up and leaving it down, when you can have the best of both worlds? Popular on the runways of Valentino and Badgley Mischka, the “half up, half down” style accentuates long tresses, while still showing off the face. The hair that is pulled back can be gathered into a small ponytail or braid, and adorned with barrettes or left plain. Another popular look that gives a nod to the 60’s and 70’s is teasing the hair at the top of the head, so it stands up above the part that is pulled back. Speaking of the 70’s, another popular look is inspired by the era – the center part. It was seen on both beach waves and straight hair, and can be left natural or slicked down for a more dramatic look. As opposed to a center part, the deep side part provides a different look that is often seen with thicker, heavier brows. Again, some designers showed off this look with wavy curls, while others showed it with stick-straight hair. The side swept hair can also be dressed up with a jeweled pin or barrette. Another popular fall look inspired by the 1960’s is the high hairstyle where all of the hair is piled up at the top of the head. The style itself can range from a high ponytail perched on top the head, to a loose topknot to a slick bun. Ponytails are always a popular trend and this fall is no different. Ponytails can be worn everywhere this season – up high, at the nape of the neck, on the side or right in the middle of the head. And this season’s ponytails are anything but boring. Use metal rings to secure the hair for a more dramatic look, a jeweled barrette to hold the pony off to the side or braid or twist the hair above the pony for a more romantic look. You may be afraid to give it a try, but if you’re feeling brave, sleek hair was all over the fall runways. You can sleek just the top and let the rest fall naturally, or try a sleeked back ponytail or angular bun. Models in the Cividini show even rocked sleek, wet-looking finger waves. If you’ve never tried a fringe before, this fall may be the perfect time to take the plunge. Fringes in all shapes and sizes are hot this season. Loose, wavy fringes that blend easily into the rest of the hair give a relaxed look, while blunt, heavy fringes make a strong statement. Extra short, fringy fringes can also be a fun way to look both feminine and flirty. Or if you’re not quite ready to cut fringes just yet, why not try faux fringes to test them out! Luxurious blow outs are all the rage this season, so get yourself a great brush and blow dryer or head into the salon to get this expensive-looking, silky look. Short haircuts are big this season but not everyone is ready to make the cut, so faux bobs are the perfect solution. Smooth, sleek hair that is clipped up gives a glamorous look, while a wavy faux bob looks relaxed and edgy. Perhaps one of the easiest hair trends from the runway to replicate is to simply go au natural. Embrace your natural curls, waves or straight, fine hair and rock it just the way is!